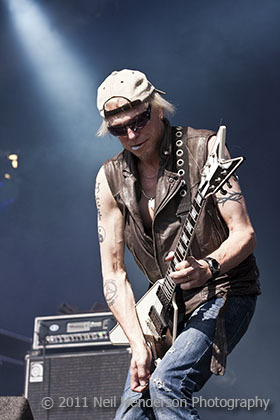 Like Slash, Michael Schenker has played with several bands and also chooses to play a range of material, including songs from The Scorpions (Rock you like a hurricane & Another piece of meat) and UFO (Rock Bottom & Doctor Doctor). 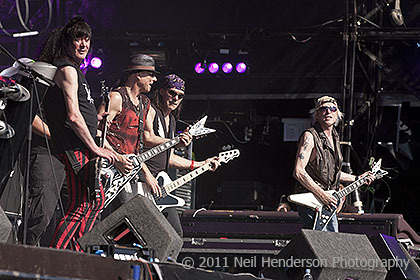 For his set at High Voltage Michael Schenker has brought a few guests with him. His brother Rudolph Schenker takes a day off from the Scorpions to come and play on "Rock you like a hurricane", "Hanging on" and "Doctor Doctor", UFO legend is wheeled out for "Rock Bottom" and "Doctor Doctor", and Jeff Scott Soto comes on stage for Doctor Doctor. Pete Way seems like a shadow of his former self which is a shame. Michael Schenker often hides at the back of the stage and plays while barely acknowledging the crowd, but today thankfully he's obviously in a good mood and remains at the front of the stage to share the limelight. Today's set includes two songs from Michael Schenker's forthcoming album, Temple of rock (Before the devil knows you're dead & Hanging on), both of which sounds great. The only problems were sound related - once again poor sound reared its head at High Voltage. Early on Michael Schenker's guitar was far too low in the mix and the vocals were barely audible at times - very disappointing. Today was an excellent performance from the legendary guitarist and sets a high standard for Joe Bonamassa to try and beat later with Black Country Communion. Highlights of the set have to be the three classics - "Rock you like a hurricane", "Rock bottom" and "Doctor Doctor".